The United Nations and Pakistani government appealed for $357 million (Â£226m) in foreign donations on Sunday to urgently help more than seven million people swamped by a second year of catastrophic floods. 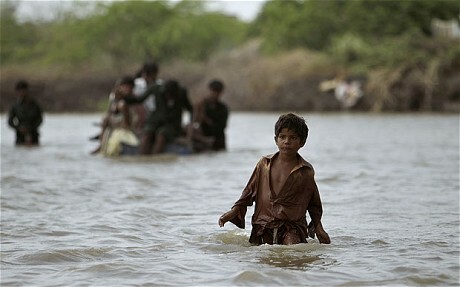 One year on from the country’s worst-ever floods that left more than 21 million people in need, Pakistan’s southern plains have been inundated again, with some parts of Sindh province swamped with more water than last summer. Thousands of people are stranded on hills and roofs, with the government unable to meet more than 30 per cent of funds needed for emergency rescue and relief efforts, it said in a joint news conference with the UN in Islamabad. The $357 million appeal is only to garner initial “life saving assistance to the most affected people” said the UN’s humanitarian coordinator in Pakistan, Timo Pakkala. “We need to look to also paving the way for some kind of a recovery for them. The water needs to be removed,” he said. Hundreds of thousands of families needed help to recover from lost livestock or crop farming incomes, while only one quarter of Sindh’s population currently has access to markets, the UN said. As much as six million acres (2.4 million hectares) of land is under water, including two million acres of arable land. Sindh’s fertile lands are the country’s breadbasket. The government’s response to the 2010 floods was panned for being late and insufficient, and this year’s disaster has raised questions over whether better flood-proofing since then could have prevented a second year of upheaval. Information Minister Firdous Aashiq Awan denied the government was at fault, blaming the disaster on climate change and insisting authorities were working to their maximum capacity. “Today my fellow countrymen are unfortunately once again passing through great hardship due to unexpected and unprecedented monsoon rains,” said Awan. “The government of Pakistan has tried its level best to cope with the situation by itself,” but required foreign help “due to the sheer scale of the disaster and the huge number of vulnerable people” she said. Further assessments of recovery needs would be carried out over the next 30 days to assess how much further aid the floods would necessitate, she added. Prime Minister Yousuf Raza Gilani has cancelled a visit to the UN General Assembly in New York to oversee aid efforts. The UN said it was working with Islamabad to get visa approval for foreign aid workers to come and help with the relief operations. The UN’s food agency is scaling up its response to reach 2.5 million with food handouts next month. Many victims are also facing dire shortages of clean drinking water, leading to outbreaks of acute diarrhoea and other waterborne disease, according to the World Health Organization (WHO). The UN’s children agency says it will distribute 200,000 litres (50,000 gallons) of water to 40,000 people daily and deploy 40 more water tankers in coming days, aiming to ensure access to clean drinking water and avert disease.